From full service to self-service and automatic to hand polishing car washing business in Bangladesh comes in all different designs. So, which direction would be right for you when you’re thinking about starting a car washing business? It could be a business with smarts and perseverance while starting a car wash business. You can draw in numerous customers who need their cars washed quickly, efficiently, and at a good price with the right location, good marketing, and top-notch service. But, if you want to detail in order to make your business profitable then you should have a significant investment, good planning, and attention. Although there are thousands of automobiles in Bangladesh, the car washing centers are not huge in quantity. Whatever you’ll find, most of them are in the large cities of the country. There has the ability to offer more services than a self-service car wash business for a full-service car wash. Also, when you’re in this car washing business in Bangladesh, you’ll be allowed the full-service wash to experience more revenue potential. What comes with the business is vehicle detailing services, vehicle maintenance services such as oil changes and filter changes and car mat washing services for an extra charge. If you can offer quality results and is easy for customers to use then it would be a successful car wash business. And it’ll be reliable for customers as well. As it’s said that car wash business in Bangladesh has not spread in a wide range. So, it’s a good chance to earn a smart amount of money to start the business of car wash.
As a starting point for your research into what it would take to start your own car washing business, we’ve grouped the following steps together. 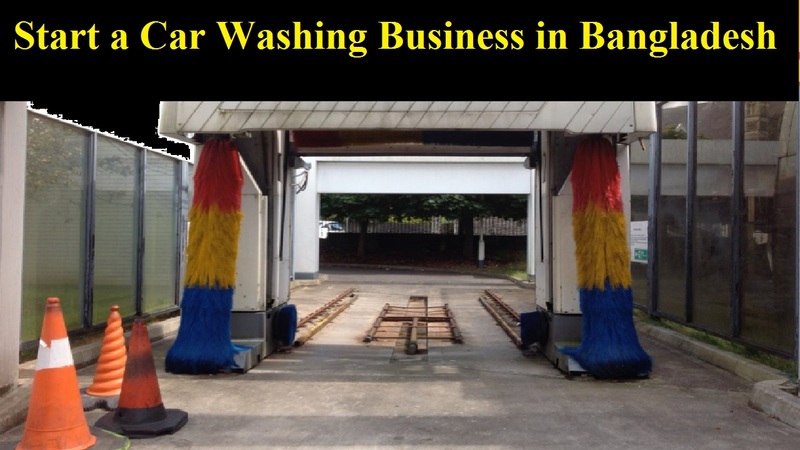 Now, let’s know in short how to start a Car washing business in Bangladesh. When selecting the location on which you want to build Great care must be taken because car washes aren’t automatically successful. What comes with the location criteria is including population, competition, street types, car counts, and more. So, if you pay a close attention to the relative traffic, types of local businesses, and anything that looks for sale, you can start by driving around your target area. Because of this, you should visit commercial real estates to get a feel for your potential market. If you want to get a feel for the local car washes in the area, you have to try more. It’s much important to know about the customers they have and how aggressively they are marketing. You have to know what they will do if you open your car washing business. Also, get the reviews of the clients whether they are frequent users and very loyal. Selecting a location with some elbow room between you and competitors is important as the entrenched local competition can be dangerous. That’s why it’s very much important to analyze the competitions and their potential solutions. It’s important to know what your local city handles business licenses and other required certifications, including Value Added Tax (VAT), Taxpayer Identification Number (TIN) etc. so make sure you take the time to understand everything and keep your business in line if there are any more different rules in your locality. Although getting information on local sanitary sewers (for your wastewater), utility prices, water usage limits, and other regulations, it may not require at the aspect of Bangladesh. If you can’t do planning of your business, set up a meeting with an expert planner. Try to get the verbal approval of the design by showing them a rendering of your concept. Or, you can make a list of potential issues to address. You can set up a formal meeting to present your plans and have them voted on at a city council meeting when you have approval. What you must be is that to try to be friendly, optimistic, and down to earth. It can make the whole process move along more smoothly if the city gets on board with your project. You have to see what makes them tick so those tours as many successful car washes as possible. Particularly, if you haven’t been in the business very long then perform some car washes research for your business. If you want to see how they differ from one another, check out automatic car washes, partially automatic, express, detailing, and other washes. Also, check out the potential operations, promotions, pricing, services, and demographics. With operations, staffing policies, equipment repairs, and customer management try to learn as much as you can and develop as deep a background as you can. It should focus on both long term and short term operations when you make a car wash business plan. Also, research what your plan is to use a professional service and remember that the more detailed, thorough. And you have to make a plan for building to long-term revenue management, and marketing strategies along with up front and overhead costs. If you need help with this concern, there are Professional companies to help you. Whether you’ll you run your car wash independently or you’ll have an LLC, you should decide it. Everyone with pros and cons, there are many models. Although solo operations offer total freedom, it deprives you of much-needed backup and brand awareness. This is the decision of how much personal involvement you’re looking for a car washing business in Bangladesh.